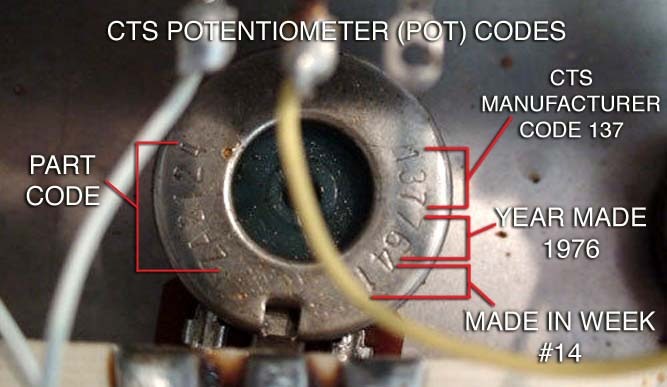 POT CODES - All vintage USA Big Muffs have source-date codes stamped on the underside of the potentiometer cans, or “pots”. The pots are what the knobs are mounted to, essentally manually adjustable resisitors that control the voltage across a circuit. The codes were created by the Electronic Industries Association (EIA) in 1920s to identify the product source and date of manufacture. 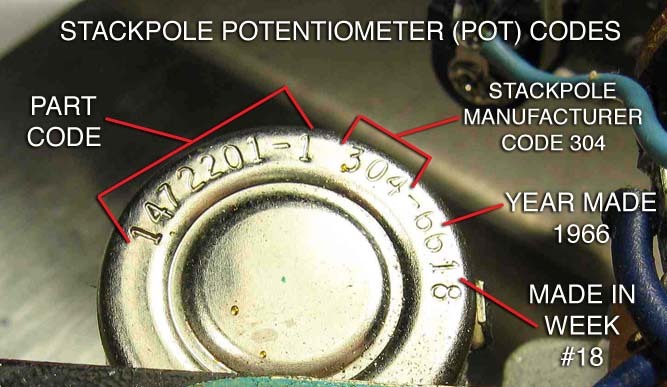 The first string of numbers is usually the part number, or sometimes the pot value. In the second string of numbers, the first three numbers are a code identifying the manufacturer. The next two numbers after the manufacturer number are the year, and the last two numbers are the week of the year the pots were made. So a pot stamped 1377833 is a CTS pot made in the 33rd week of 1978. Note that this does not mean a Muff with a 1978 pot was actually made in 1978, it just means it was not made much earlier than 1978. The Muff could have been made months or even years after the pots were purchased as it is known that Electro-Harmonix bought the pots in bulk, as did Fender, and other companies at the time. Stackpole and CTS made the pots in large runs also, so they may have shipped pots dated earlier than the year Electro-Harmonix ordered them. This just gives you a ball-park age for the Muff. Some Triangle Muff pot codes are dated 1966, two years earlier than the founding of Electro-Harmonix! Even buying new CTS pots today does not give you an accurate age because they are dated several months in advance of actual manufacture. The pots on the newer USA made E-H Muffs after 1999 do not have date codes. The Russian made Big Muff pots also lack date codes. POT TYPES and REPLACEMENTS - Vintage USA Big Muffs have single-gang linear taper 24mm 100k potentiomers. Electro-Harmonix used pots from various makers, but they were usually the 24mm size, with 1/4" knob posts. Logarithmic taper pots, or audio pots, will also work for the volume pot and sound better, but they are more expensive than linear. Russian made Big Muffs have Russian made pots, usually 100k linear taper. You can use 100k audio log taper for the volume pot. Electro-Harmonix used both at various times. They have also used 150k pots. If you replace an old pot with a new one of the same size, it is sometimes hard to find pots with the same pot shafts that fit the old knobs. You can sometimes pull the shafts out of the old pots and install them in the new ones. For vintage USA Big muffs, carefully bend back the four tabs on the top/back of the casing on the old pot, slide the casing off, then remove then shaft. Open the new pot this same way and install the old shaft. Be very careful not to damage the internal tracks. Something to keep in mind, some pots are letter coded with A and B to represent linear or logarithmic, but there is no worldwide standard for which is which. In general, the USA standard, which I believe came from Japan, is A=log and B= linear.  The European standard is A=linear and B=log.